The manifesto also focuses on agriculture by setting a target to make at least 30 per cent of unirrigated land partially or fully irrigated. 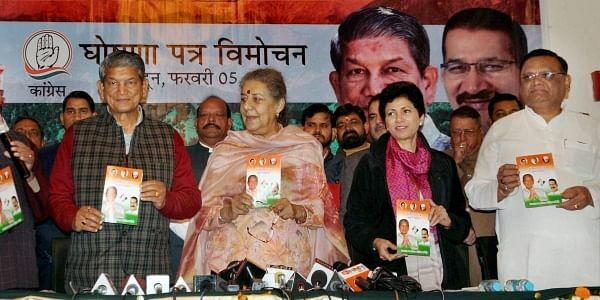 DEHRADUN: Congress today released its manifesto for Uttarakhand which focuses on stopping migration from hills, disaster management, infrastructure development and economic empowerment of women. Releasing the manifesto along with in charge of party affairs in the state Ambika Soni, PCC president Kishore Upadhyay and Kumari Shailja, Chief Minister Harish Rawat said it unveils a clear roadmap for the development of the state on indexes like halting migration from hills caused by the absence of employment avenues, economic empowerment of women and creation of basic infrastructure. The manifesto also focuses on agriculture by setting a target to make at least 30 per cent of unirrigated land partially or fully irrigated over the next five years, he said. Disaster management mechanism will be further strengthened by appointing five 'aapda (disaster) mitras' in every village. Employment opportunities will be generated in remote hill areas through renewed emphasis on skill development of local youths to stop their exodus in search of work by 2022, the chief minister said. The manifesto also promises the creation of new districts, development of infrastructure, boosting connectivity and building a modern Uttarakhand.